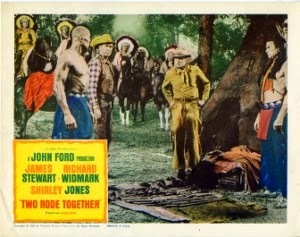 Based on the Will Cook novel Comanche Captives, the 1961 John Ford Western Two Rode Together was marketed as a film telling the story of “the real West.” While it’s still a far cry from the greatest Sam Peckinpah classics or the more recent HBO series Deadwood, it does make an honest attempt at de-romanticizing the Hollywood version of the West. This troubled production (Ford reportedly labeled it “crap”) is now available for the first time on Blu-ray as a limited edition from Twilight Time (only 3,000 copies pressed). Despite its relative obscurity, it’s a worthy reissue. Regardless of Ford’s withering self-assessment, Two Rode Together is a scrappy little treat. James Stewart, in his first role for Ford, stars as Marshal Guthrie McCabe. We see all the usual Stewart charm, except that this time it’s masking a deeply apathetic attitude. McCabe would rather sit on the porch, drinking beer, than get his hands dirty. His pockets are well-lined by the ten percent commission he skims from all the businesses in his town. When Lt. Jim Gary (Richard Widmark) rides into town with a bunch of soldiers, imploring McCabe to join him on a special mission, the marshal couldn’t be bothered. The two things that change his hyper-cynical mind: money (of course), and the chance to get away from his nagging quasi-girlfriend Belle (Annelle Hayes). The mission, it turns out, is better conveyed by the original novel’s straightforward title than the movie’s more poetic moniker. McCabe and Gary are to confront Comanche Chief Quanah Parker (a real historical figure, here portrayed by Henry Brandon) and reclaim a number of whites that have been held captive by his tribe for years. The material manages to get considerably dark as the partners soon realize this rescue mission will yield mixed results at best. A boy now known as Running Wolf (David Kent) has grown up among the Comanche and considers himself one of them (reintegration proves disastrous). A Mexican woman, Elena de la Madriaga (Linda Cristal), has been paired off with Chief Parker’s arch enemy Stone Calf (Woody Strode) and is now seen as damaged goods by both the Comanche and the white folks. 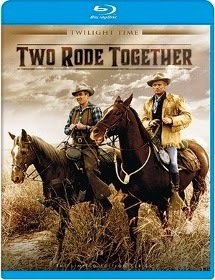 Two Rode Together isn’t as action-packed as one might expect for a Western of this era, preferring a more casual approach to telling these characters’ stories. Stewart and Widmark exhibit believable chemistry. It’s far from John Ford’s best remembered or most celebrated Western, but it’s definitely worth seeking out. Twilight Time is to be commended for giving it a proper release. As for the visual presentation, outdoor location shots often betray their age with soft focus and inconsistent contrast levels. But overall the high definition transfer offers a solid image with suitable detail (especially in close ups). The lossless DTS-HD MA 1.0 mono track is efficient but understandably simple. The only special features are George Duning’s score as an isolated DTS-HD MA 2.0 track and a theatrical trailer. The booklet includes a new essay by film historian Julie Kirgo. For ordering information, visit Screen Archives.